The RBSA is Birmingham’s oldest artist-led group and the only artist-led group in Birmingham that owns its own gallery and has a permanent venue for its activities. Located just off the only surviving Georgian square in Birmingham, St Paul’s Square, the Society dedicates three floors of exhibition space to fulfill its charitable objectives: to promote artists and the appreciation of the visual arts. Since the beginning of 2013, I have been co-curating an exhibition with recent Birmingham History of Art graduate Chloë Lund for the Royal Birmingham Society of Artists. As an Undergraduate Archive Volunteer, I have enjoyed access to the RBSA’s treasures from its Permanent Collection at close hand, and our exhibition displays a rich selection of the artworks acquired by the RBSA in the past five years, as well as some that have never before been exhibited. The exhibition will not only explore the contents of the Permanent Collection but also the relationship between the Society and the local community, which includes students at the University of Birmingham–each and every one of you! 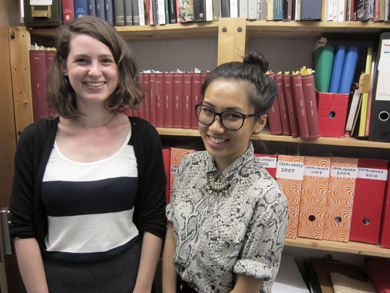 Art History students at the University of Birmingham have many opportunities to get involved with the RBSA, and you can read a bit about what other students have got up to with them here and here. The RBSA’s substantial archive is an invaluable resource for the understanding of the history of the Society and its relationship with the people of Birmingham, as well as the wider artistic community. Edward Burne-Jones, a Pre-Raphaelite artist, was himself President of the RBSA as well as other notable artists such as John Everett Millais. Included in the exhibition is a work by the acclaimed photo-realist artist, John Salt, whose work can also be seen during the BMAG’s exhibition on Photorealism. The stories of the Archive have been told through the contributions of many different people and have helped us to create a collective memory of the Society. This exhibition aims to reveal the ways that the Collection and Archive have been shaped by our relationships with our supporters, community, local environment which includes the all the students at the university. During our exhibition, we will be hosting a variety of free events which include a Student Friendly on Friday 15th November . The night is open to everyone and anyone; it will be an informal, relaxed evening where we, the curators, get a chance to talk to our peers about the Society and this exhibition over a glass of wine! There will also be a chance to join us on a walk around the local canals of Birmingham with RBSA Member Paul Hipkiss who will be talking about his prints inspired by the local places on Saturday 16th November. Finally, there will be a free demonstration by RBSA Member John Shakespeare on Saturday 23rd November. Curating the RBSA Archive Exhibition has been a challenge that I have relished. The project has given me the chance to find out so much more about the thriving artistic culture in Birmingham and as a born and bred brummie, this has revitalised my own interest in the city. 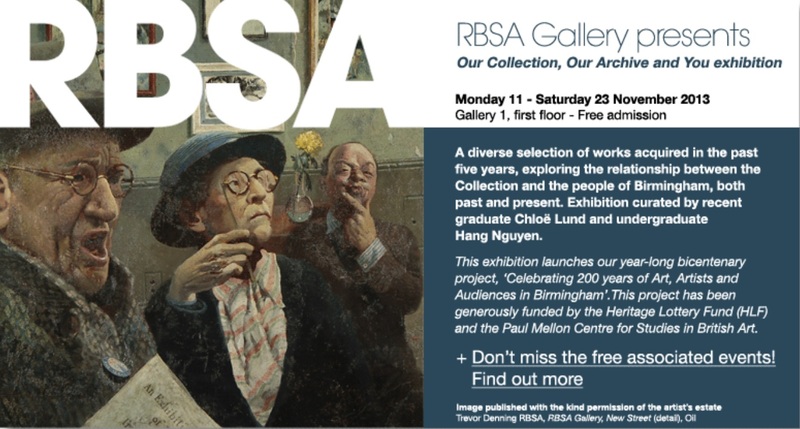 I hope to see you all at the RBSA for the Archive Exhibition, helping to write more chapters in the story of the Society as well as the city.